Model set-up is quick, thanks to a number of predefined physics interfaces for applications ranging from fluid flow and heat transfer to structural mechanics and electrostatics. Material properties, source terms, and boundary conditions can all be spatially varying, time-dependent, or functions of the dependent variables. 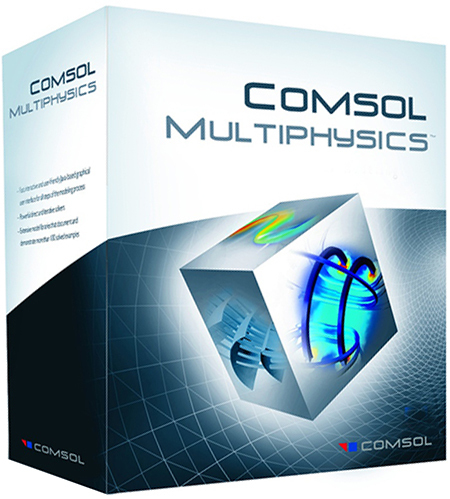 You can freely mix physics interfaces into new multiphysics combinations as well as couple with any application specific module. As an alternative to writing your own simulation code, the COMSOL Multiphysics user interface gives you the option to specify your own partial or ordinary differential equations (PDEs or ODEs) and link them with other physics interfaces. When combined with the CAD Import Module or one of the LiveLink products, this enables you to run custom simulations on CAD models from industry-standard formats. - Geometry and Mesh – Core functionality enhancements include new geometry subsequences for user-defined geometric primitives, if/else statements in the model tree for geometry creation, and mesh export to NASTRAN file formats. - Mechanical and Acoustics – The Structural Mechanics Module now provides easy access to rotordynamic forces and includes a new fast penalty method for contact. Joints with friction and three new joint types have been added to the Multibody Dynamics Module, while new evaluation methods for nonlinear materials and thermal fatigue are now included in the Fatigue Module. The Acoustics Module now offers aeroacoustics simulations based on the linearized Euler equations, enabling better simulations of noise in jet engines, mufflers, and gas flow meters. - Heat Transfer – The Heat Transfer Module now includes two fast and memory efficient methods for modeling radiation in participating media, the thermoelectric effect, and heating in biological tissues. - Fluid – Surface wall roughness for turbulent flow and a more efficient outlet boundary condition have been added to the CFD Module. Mass and energy conservation for laminar flow is greatly enhanced thanks to updated flow formulations. - Electrical – The AC/DC Module now contains a nonlinear magnetic material library. A new feature in the RF Module enables the simulation of components with ports on interior boundaries. The Wave Optics Module now includes scattering with a Gaussian background field and Laser Heating interface. The Semiconductor Module has been enhanced with many updates, including heterojunctions and tools for impact ionization. - Multipurpose – The Optimization Module is now expanded with a new gradient-based method for topology optimization, and a gradient-free method for geometric dimensional optimization. Particle-field and fluid-particle interactions can now be easily modeled in the Particle Tracing Module using a new efficient method.